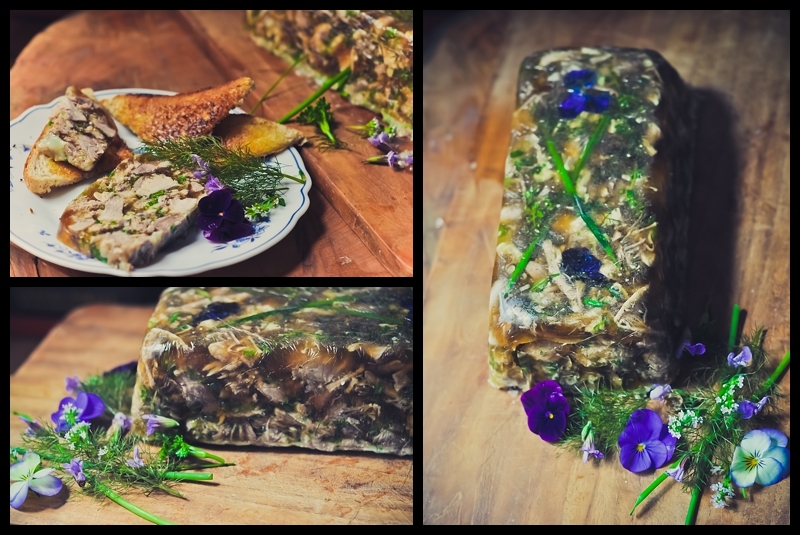 Whilst the process of making pig’s head terrine (also known as brawn or head cheese) may not be for the squeamish, sometimes in order to make something beautiful you have to get your hands dirty. 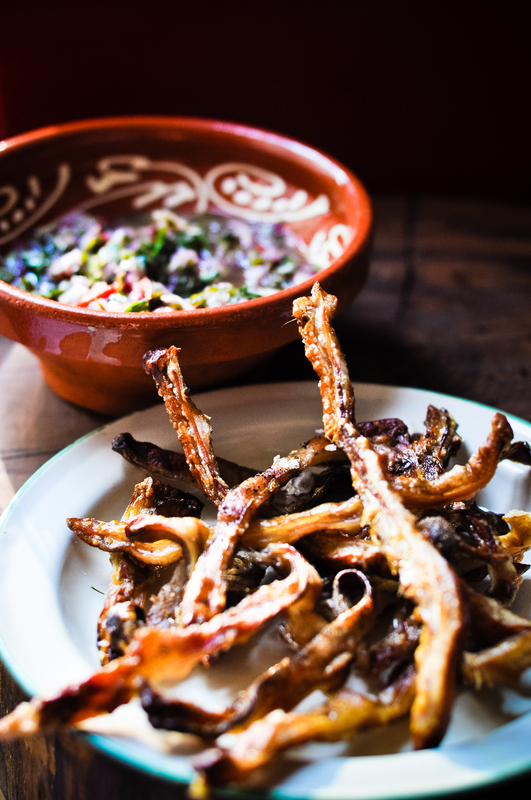 The idea of combining pig face with flowers is not simply a visual one. 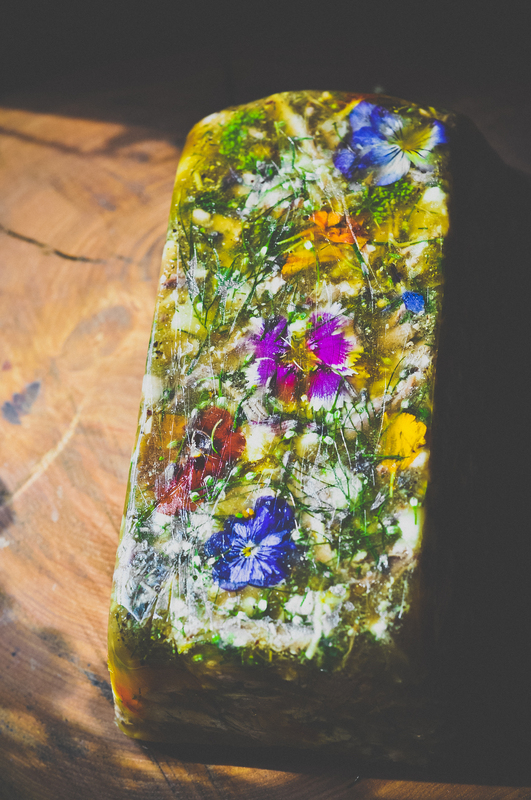 Although using the violets does make it look very pretty I wanted to use the flowers of herbs such as sage, thyme, chives and parsley to create little bursts of intense herbal notes through the dish. I had a look online for various recipes, but none of them really worked for me in terms of flavour so I turned to Fergus Henderson‘s Nose To Tail Eating as a rough guide and decided to make it up as I went along using whatever I had to hand in the veg rack and garden. £3.30 worth of meat from the butcher made 2 big terrines. Bargain. My butcher provided me with 1 split pig’s head (£3) and 2 trotters (30p). 1: Rinse the head and trotters thoroughly and remove the ears (if you are making the crispy pigs ear scratchings) and clean the wax out (I have a little brush that’s only reason for existing in my kitchen is to clean the wax out of severed pigs’ ears) then put in a massive pot, cover with cold water and bring to a boil, lots of scum will rise to the surface. 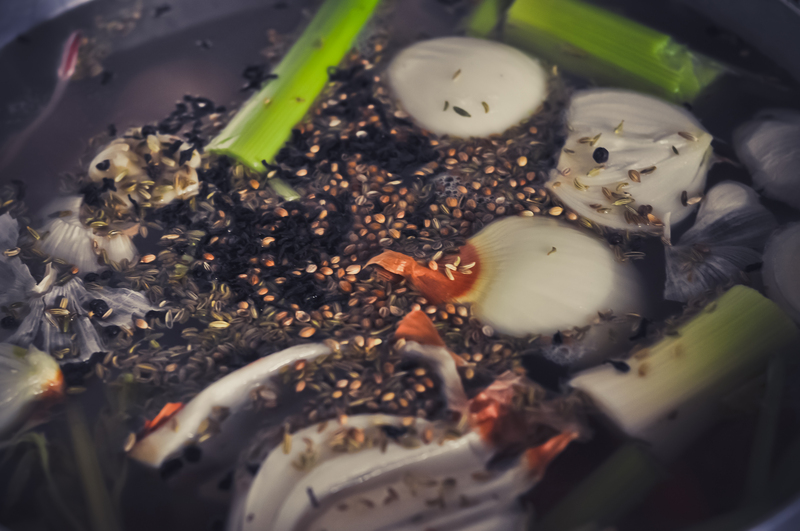 Drain of water, refill pot with fresh water, add the rest of the stock pot ingredients and bring to a simmer. 2: After about 2 hours remove the 2 ears and set aside to dry thoroughly. Continue to simmer the head and trotters for about another 2-3 hours or until the flesh is starting to fall away from the skull. 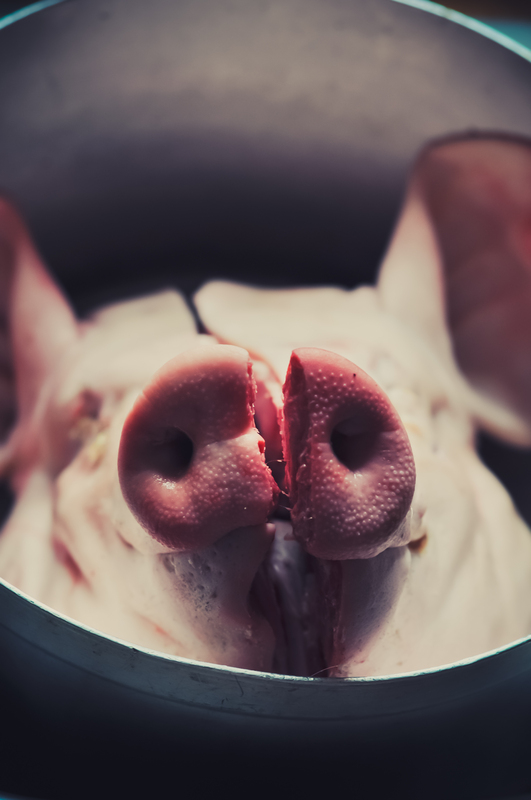 3: Remove the head and trotters and set aside. Strain the stock through a sieve ( I usually do it a few times) to remove all bits and return to the pot and reduce by about two thirds. Taste and add salt and saffron. 4: Remove meat from the head. How much of the head you use is entirely up to you. I only had 2 terrines to fill so used the meat and skinned the tongue and used this too but some use the snout and fat also.Chop your meat and combine with chopped herbs and black pepper. 5: Line your terrines with cling film and place a few violets and chives on the bottom. This will of course become the top, it makes it look pretty. Add your meat then fill with reduced stock. Bang the filled dish against the worktop a couple of times to get rid of any bubbles and make sure your stock gets to the bottom. Cover with cling film and chill overnight to set. 6: The following day just gently turn it out, admire your amazingness then make some toast, slather it in butter and top with your terrine. These are seriously good! Once the ears were cooked in the stock I just treated them as I would when making regular pork scratchings. Just whack the oven on full, make sure the ears are completely dry (they will be really sticky though) then using sharp kitchen scissors cut them into strips and put on a grill tray over a roasting tin, sprinkle with Halen Môn salt, cook until crispy and serve with a kickass dip. Next time I make them I will probably braise the ears in a chinese broth first if I’m not making a terrine at the same time.